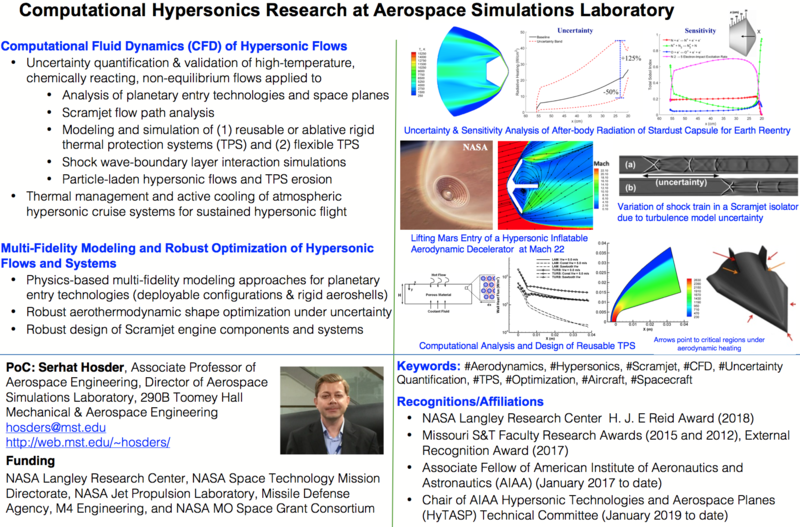 The research activities in the Aerospace Simulations Laboratory (ASL) focus on the fields of computational aerothermodynamics applied to modeling of hypersonic flows and technologies including thermal protection systems (TPS), uncertainty quantification, planetary entry systems including deployable technologies, aerodynamic shape optimization, robust design under uncertainty, and flow control. In general, our research includes computational studies for the development of methods under each or the combination of the aforementioned areas and the application of these methods to the solution of aerospace problems focusing on high speed atmospheric flight vehicles and planetary entry technologies. Our research has been funded/supported by NASA Langley Research Center, NASA Space Technology Mission Directorate, NASA JPL, Missile Defense Agency, M4 Engineering, Inc., University of Missouri Research Board, and NASA Missouri Space Grant Consortium. These research activities have resulted in several journal articles and refereed conference proceedings co-authored by Dr. Hosder and his students, who have received prestigious fellowships including 2 NASA Space Technology Research Fellowships, 3 NASA Pathways Internships, 1 Amelia Earhart Fellowship, and various awards from the university during their graduate studies. Below chart gives an overview of our current research activities which focus on uncertainty quantification and multi-fidelity modeling of hypersonic flows and technologies, thermal management of atmospheric cruise vehicles for sustained hypersonic flight, and robust design of high speed vehicles under uncertainty.